of our current story inventory of more than 200 instruments. and his fine staff of luthiers handmade in Northern Ireland. 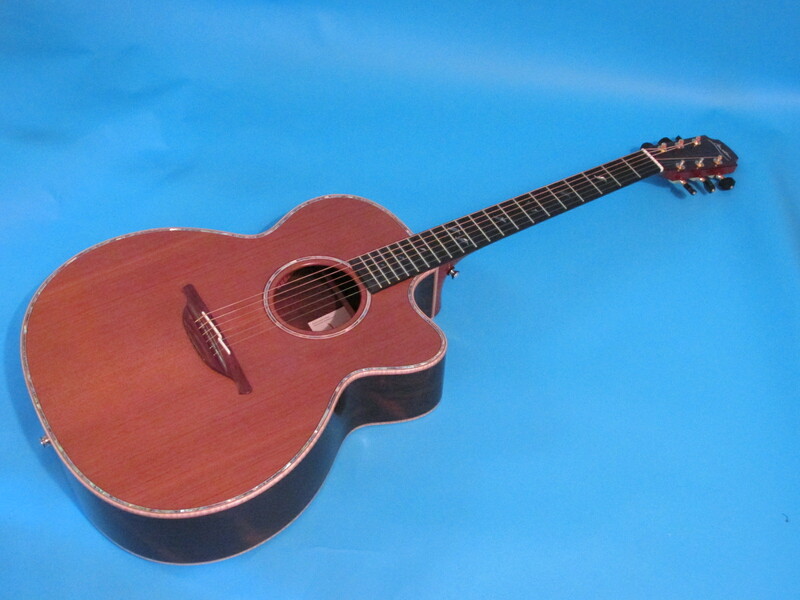 The body is a jumbo 0-size cutaway model with a Brazilian Rosewood body, which is the Holly Grail by which all other tone woods are judged in terms of sound and aesthetics.The top and sound hole rosette are decorated with abalone perfling. It has a multiple piece mahogany C neck, a cedar top with maple binding. The headstock and bridge—with a split compensated bone saddle—are rosewood. Tuners are Gotoh 510 gold plated with ebony buttons. The bone nut is 1.75. This guitar has a big, clean and clear sound and works perfectly with finger style or heavy strumming. Finished in satin for which George’s guitars are known.It also has a clear pick guard that is hard to detect without a close up look. Condition is near mint and the guitar has no evidence of hard or any significant playing. One last thing—the ebony fingerboard had tilde abalone fret markers.